Dining with seats for 30! Amazing, spacious kitchen with all the equipment you need to cook for 25! Love this house! It's perfect for large groups with all the bathrooms. We had an absolute wonderful time! We had a great time. We enjoyed visiting with family. The younger generation enjoyed the swimming pool and the beach as well as driving the golf carts. We enjoyed our stay greatly. Some notes for the mgmt team - one towel and one bath cloth per person is okay, but maybe leave 4 extra sets by the washer/dryer and then that will help with a couple of people who use 2 towels when showering - ya'll were very accommodating with the extra towels and bath mats, so thank you very much. Our family made two piles when we left, to help the maid staff. Also, fyi, when we were in the pool, we noticed some flashing missing right by the lease sign that hangs from the fencing to the patio above the pool area - just fyi so your maintenance team can fix. We really like unit 3 as it's farther away from the trash area, so we'll likely aim to rent #3 again. Thank you, great management team with Port A Escapes, have recommended your management team to another family already this summer! We have stayed here numerous times & the house was still in great shape after hurricane Harvey. I was glad to see new blankets on all the beds and the upkeep has been maintained. We will be back next year! Everything was good. Parking lot needs lines, so people don't take up 2 spots, but all in all, it was a great place!! This was the sixth time I have rented a Clubhouse. We love how spacious it is and well equipped for large groups. From the large kitchen to the dining area to the pool, it is perfect for our family reunion. The Beach Clubhouse 3 was the perfect venue for our 5-day family reunion! We had 24 people: 12 adults and 12 children. The 10-bdrm/8.5-bath home was just right for us. The spacious common areas made it easy to prepare our own meals and have plenty of seating. Most of our grandchildren didn't even know what a table shuffleboard was before arriving. It, as well as the ping pong table, got a lot of use. By end of week the older ones, and their parents, eagerly participated in a shuffleboard tournament. Our group walked to and from the beautiful beach. Boogie boards, sand castles, the little ones chasing flocks of birds -- all fun! Loved the sunsets! We were less than half an hour from Schlitterbahn, and 1 hour from the USS Lexington in Corpus Christi. Port A Pizzeria was great for the first night, before grocery shopping. Bought most of our groceries at the Wal-Mart in Aransas Pass before crossing on the free ferry. IGA on the island had most of the things we needed to pick up later. All the family had a blast in our own pool the last night, after swimming at the beach. A great reunion/vacation! Perfect for a corporate event. We had everything we needed along with great weather! HAVE BEEN DOING THIS ANNUAL FISHING TRIP FOR THE PAST 17 YEARS. THIS HAS BEEN BY FAR THE BEST ONE YET. We are glad to hear you had a great time and hopefully you caught a lot of fish. Hope to see you again next year. I can not say enough good words about our experience at Beach Club #3! It is a perfect set up for large groups with plenty of beds, bathrooms and seating. Our group consisted of 8 families from ages 18 months to 70 plus. The location was great and it was so easy to prepare meals and then sit down together, We had 2 service reequest: needed a broom and then a battery to replace the chirping one that went off at 9:00 pm and was in a ceiling fixture too high for any of us to reach. Prompt and polite quick responses! The pool heated up very quickly and the kids loved it. Yes the forks, knives and spoons were sparse, but we expected that and planned. Great place and nice people to deal with! Had a group of co-workers staying for meetings and team building. The kitchen is perfect set up to host everything there. the living and dining room were great for our presentations as well. This was our second time in this house for our family vacation. Great space and location. Was a tad bit disappointed in the cleanliness of the sheets, towels, and the floors had not been swept or mopped thoroughly. The furniture on the upstairs patio was rusted and broken down. Overall it was a good stay. Communication with the office was great when we needed something. Overall the house worked really well for us. Location to the beach was great and we often walked. The pool was perfect for everyone and used it several times daily. The king beds were great and really comfortable - not something that is expected with a beach house and we all slept well! Having 2 refrigerators, sinks and dishwashers worked beautifully. Also all the tables and chairs were great. For our group, having a TV in each room was not needed and we all wished there were lights next to the beds. We did have some issues when we arrived - standing water in one of the dishwashers that would not drain, the pool was dirty, some light bulbs out and not enough flatware for our group. I will say that the management company was very responsive and the issues were fixed the next day. The parking situation needs some refinement. We only had 5 cars however on several occasions we were not able to park in the lot. Would be helpful if the mgmt co issued parking stickers for the cars or somehow labeled the parking spaces for each unit. We would definitely stay here again! 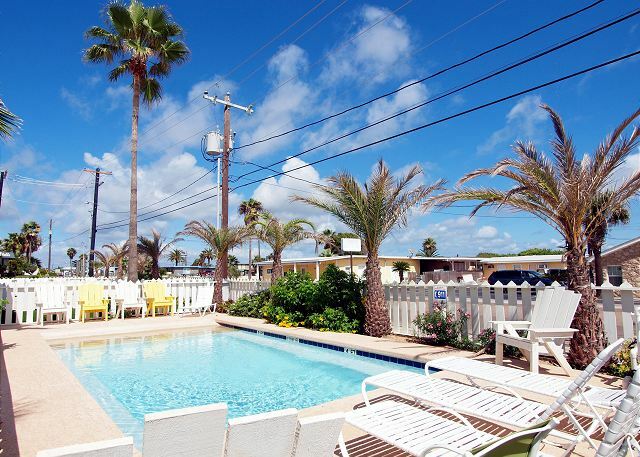 We absolutely loved our stay in Port Aransas! The property was beautiful and well-appointed. One of our favorite things was being able to eat together in the huge dining area. We had a wonderful time. We shared it with our grandchildren and great grandchildren. They were all pleased. We are glad to hear that you and your family had a wonderful time. Just give us a call when you are ready to come back to Port A. Overall we had a great experience. We will hopefully be back. The positives far outweigh the negatives. The positives are tons of space, very clean, appealing look. The negatives are its very loud, was hard to sleep in the morning once anyone was awake, especially excited kids. The comforter on one of the beds was very dirty when pulled away, found a pile of hairs, strange actually because the whole place was very clean. Beds were comfortable. Was very nice to have our own splash pool after a day at the beach to refresh. 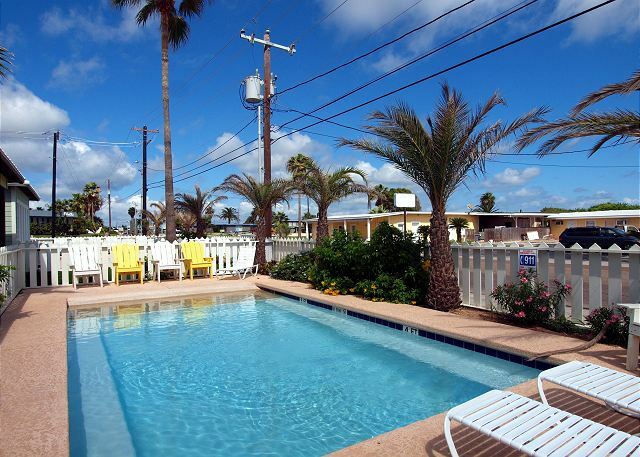 The entire family enjoyed the rental property as well as its proximity to beach and local establishments. We would be more than happy to recommend this property to friends and family. We are glad to hear you enjoyed your house along with its location. Just give us a call when you are ready to come back and do it again. Great for large families or groups. We were hosting our immediate family members who traveled from all corners of the U.S. for our son's wedding. Being close to the beach and the pool kept the kids busy and happy plus being able to cook for such a large group and set down to eat together was the bomb. This was the perfect place for us. We had a great time with extended family members coming in from various states and cities. Another memorable experience, the condo was perfect! I rented the Beach Clubhouse 3 for 4 nights for my family of 21. It was perfect. Close to the beach, private swimming pool and a wonderful facility for my 11 grand kids and their parents. Lots of space for sleeping, cooking and playing. Could not have a more suitable place for my crew. We had a large group with 8 couples and lots of kids ranging from 2-18 yrs. It was spacious for all of us. It had great gathering in dining, open to kitchen and living so no one was left out. The kids loved the pool and got a lot of use out of it. The showers outside was very helpful. We ate every meal at home and had great space for food. When we arrived there was some trash and cig. butts in the back and meat left on the grill but the office promptly took care of it. The beds were very comfortable, the house was stylish and not too over done with cheesy beach decor. The location is perfect- best spot on the island! Plenty of parking and I was afraid of neighbors being so close and exposed in the back area but It was not a problem at all. Everyone in our party was really impressed and I got a lot of props for finding this house. I would stay here again and I highly recommend it. Great property. Space and layout were fantastic. Location was great. House was clean. Very positive experience for our large group. wonderful kitchen! perfect to feed a crowd!! House is very well equipped, very clean, great spaces to chill. We were VERY happy and would always come back. This house was everything it promised and more! BIG and SPACIOUS, yet cozy and relaxing. We had 13 people in our group, which was a business retreat, and it could not have been better. we have stayed in atleast 15 houses in port a over the years And this was by far the best for multiple families, kids and adults. Never felt crowded, classy simple decor, plenty of kitchen space. We walked to beach, eat pizza and to gas station.matinee came immediately to heat pool and bring bbq grill. Will definitely be back for Sandfest! For the second year in a row we shared an awesome Christmas with the entire family in one facility! Everyone loved it! Plenty of room to be together, plenty of space to get away if you needed it! Facility has large open areas, never felt crowded and is well insulated...Karaoke at top volume was barely audible outside! Hope we can do it again next year! We loved our stay at this property! It was perfect for our large group. It was close to the beach--easy to walk to-- and it was also very close to shops in town. We received good service from Port A Escapes. We will return next year for our retreat, if it is in Port A. We rented this for a fishing trip. There were 13 of us guys and all was good until we checked the BBQ grill. It smelled like a dead cow and we found rotting meat that somebody had left. I am sure that it does not get checked after guests leave. Other than that, it was a great place when you have a large group. When we first walked into the houses we were blown away with everything about them; the kitchen, the dining area, the # of TV's, the NEW HOUSE smell, the games, the bedrooms, WOW!!! Not one of the 26 guys that we had there failed to complement me multiple times on the accommodations and how well they worked for us. The location couldn't have been better either. There is no way that don't stay there next time that we come down and there is no way that I don't bring mine as well 3 other families down there for a summer vaca. Loved, Loved, Loved this beach house! We chose this house for our 2nd Annual mother/son trip with a group of teenage boys. The house was very clean, charming, well thought out. We had all that we needed to cook & entertain our large group! It was very close to the beach. I'd definitely stay there again!! Loved the place! We will be coming next year. This was the 2nd time our group stayed here. We greatly enjoyed our 1st visit, so we decided to return the following year. Our 2nd time around was no different. It's a great property and accommodates everything our group needs/expects. We loved having a pool on-property as well as the large kitchen. With two ranges/ovens, two fridges, two sinks, and two dishwashers, this home was perfect for our large family reunion. Everyone LOVED having their own bedroom (king-sized bed) and bathroom, and no one was left sleeping on a futon or pull-out sofa as one of the sleeping locations many properties advertise. Our group all wanted their own BED (not futon or couch) and bathroom, and this property has plenty of both. My only complaint is the Port A Escapes website advertised this property as having a DVD player, and it doesn't. I also believe there are only 9 king-size beds and 4 twin-size, instead of 10 king and 6 twin, as advertised. We didn't use all of them, so this wasn't a problem for us this time. Also, parking is little tight, especially since our group was traveling in several cars from all over Texas. The beach is only a short walk, which is great for those who want to go, and the rest can enjoy the pool. Awesome facility: packed with fun! Rooms were comfortable and there was plenty of bathrooms. I have been in a situation where it took a long time to clean up to go out, we were all ready in a jiff. The group is already asking when we can go back. I guess I will see that place again soon! The unit was absolutely perfect for a large group. The space was well planned and efficient with plenty of seating, beds, bunks, and linens. The kitchen was a dream for this large number of people with two refrigerators, stoves, sinks and dishwashers. We took a group of about 16 kids and 10 adults to Port Aransas for a senior trip. We could not have asked for a better place. We paid to have the pool heated (perfect in March), the place was spotless clean, and everything we needed was there. An easy 5 min walk to the beach, and a 5 min walk the other direction to shops, restaurants. Picking up and dropping off the key was easy, and the management co was easy to work with. We had no problems with the house whatsoever. Pool light was out, but that was no problem for us. Plenty of towels, dishes, utensils for a crowd. More trash bags would be great. There is a bedroom on 1st floor that you have to go out the back door to get to. The door to that bedroom opens to the back patio. We won't hesitate to stay here again. I loved the minimalist theme of these houses though it would be nice to have some decor especially in the bedrooms. Also, for those staying in multiple units a pass through gate between each pool area/ front yard would be a good idea. This was a great place for our wedding! I should also mention the parking is a bit of a problem. Each of the surrounding businesses were rather bitter about offering additional parking. Even for a price! Almost everything you need except a few kitchen gadgets otherwise I give it a ten we had 13 ladies and there was plenty of room and bathrooms. Will definitely stay there again! THIS IS A GREAT PLACE TO STAY AND LOTS OF ROOM FOR A LARGE CROWD . WE WILL BE BACK NEXT YEAR..
We have been going to Port A for 10 years, during the 4th of July, being able to stay in one house made our family reunion the best! Perfect for big family fun. Beach house is well design to hold a large group under one 's only two blocks far from beach. The house was great! Perfect for youth camp I do have a few suggestions for the owners and one for the rental company! 1. Buy bigger trash cans for the first floor. If you are expecting 26 people to stay in the house then the little cans there now are way too small. 2. Put a ice maker in all 4 of the beach houses. 26 people in huge ice needs more ice. Or at least change description on amenities. 3. For rental company have renters notify of arrival so you can have AC turned on so house is cool when they arrive. Those are just some suggestions I recommend. We had a great time. Awesome house. We loved the setup and the location. We will be back again. This rental property is wonderful - clean, new, and comfortable! I was hosting a group of 6th and 7th graders and we were able to cook, clean, and enjoy the beach. I was thinking about coming back with my family. The property is very new and nice, and offers a lot of space. The walk to the beach is less than 5 minutes. The kitchen is fully stocked and there are TVs in most of the bedrooms. A great find! Already planning another stay. Need I say more. Great floor plan, great kitchen, an overall superb weekend.